Learned to make this rich creamy soup from my mom. She worked at the Indonesian Embassy until her retirement. Got this recipe from an Indonesian colleague. 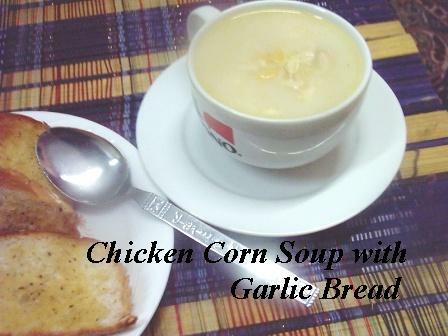 The soup goes very well on it’s own or served with toasted or garlic bread. Put chicken in a large pot. Pour in enough water to cover the chicken and boil till chicken is tender and cooked through. Drain the chicken and leave the stock in the pot to simmer on a slow heat. When cool enough to handle, shred the chicken. Set aside. In a small pan, melt butter and sauté the garlic & ground peppercorn till garlic turns golden. Pour in a ladleful of the simmering stock. Stir, then pour back the stock into the pot. Increase the heat to allow the soup to start boiling. Add in the cream-style sweet corn, then the milk/cream. Put back the shredded chicken into the soup. Reduce the heat. Let the eggs flow in a thin line into the soup while the other hand continuously stirring the soup using a fork or a chopstick. We want strings of eggs and not clumps of eggs floating in the soup. Seasoned with salt and more pepper if you like.